Congressman William J. Jefferson (D-LA) took the concept of cold cash a bit too seriously. 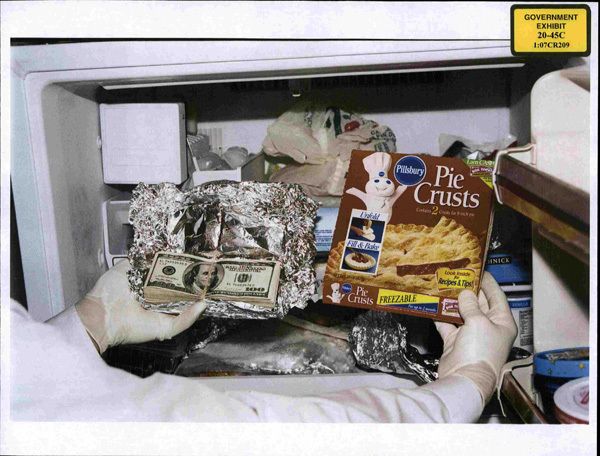 He stored his “piece of the pie” in $10,000 bundles in pie crust boxes in his freezer. Worse, the more authority the government claims for itself, the more parts of society it affects. This rouses otherwise dormant factions to defend their interests. Thus, the price of politics rises higher and higher. More federal power means more interest groups and therefore still more side deals. If you want to know why the population of metropolitan Washington has skyrocketed, in numbers and wealth, over a generation, this is the answer. An ever-more ambitious government has drawn more and more interest groups to the capital to make sure they get their cut of the federal pie. This helps account for the disaster of Obamacare. There are, of course, vigorous debates to be had about whether government should be responsible for everyone’s health care. But for our government to accomplish this goal, Obama and congressional Democrats had to buy off a motley crew of factions. Indeed, this was one of their principal concerns: luring on board the “stakeholders” who had stymied reforms before. Cost is making a basic mistake in causation here. He argues that this “price of politics” is a feature of our system of checks and balances. What we the people have done over and over since ratifying the Constitution is expand the power of the federal government without revising its structure… As Washington’s reach has been extended, instead of overhauling the structure, we have merely tinkered at the margins, modifying the Electoral College, instituting direct election of senators, limiting presidential terms, and so on. The result is a profound mismatch. We expect an essentially pluralistic government to behave as a national one. It cannot do this, and so public policy is characterized by inefficiency, ineffectiveness, and even at times injustice. This is where Cost assigns blame for the problem that passing legislation requires buying off multiple energized constituents. Implicit in his argument is that some other system designed for powerful rather than limited government would not require such payoffs. This assumes, however, that in that other system we will have found, to paraphrase Jefferson, incorruptible angels to govern us. It neglects the reason that people attempt to influence government officials. It isn’t that powerful interests in our system of checks and balances need to be bought off—it’s that government has taken an interest in them, and so they feel it necessary to take an interest in those who write our laws and regulations. This is a symptom of any powerful government, not just powerful governments that have grown from limited governments. There is no government that does not invite bribes and other forms of corruption when that government starts making laws affecting the interests of powerful groups or groups that can become powerful. Google didn’t start lobbying DC because Google needed to be bought off. Google started lobbying DC because DC was making and threatening laws that affected Google. And DC did not deliberately draw Google’s attention so as to more easily pay Google off. DC politicians deliberately created milker bills to draw Google’s attention so that Google would pay DC. Cost’s mistake is assuming that politicians are incorruptible except for the dastardly special interests who corrupt them. But most special interests would rather be left alone to pursue their special interests. From the NRA to Google, they had to be drawn in to Washington. They were drawn in by the increasing power of government meddling in their affairs, and would have been drawn in regardless of the form that government took. Whether king or senator, if a lawmaker takes an interest in you, you by necessity take an interest in that lawmaker, and you provide what they want, whether it’s money, gifts, or people. Corruption flows from power. If we want to shed corruption in government, there is no easy solution. We need to shed government power. The price of politics last modified December 6th, 2013.